The Silencers were a Scottish rock band formed in London in 1986, consisting of Jimme O'Neill, Cha Burns, Joseph Donnelly and Martin Hanlin. Their debut single was 'Painted moon', written by O'Neill about his reaction to the Falklands war. Their first album 'A Letter from St. Paul' was released soon after. The Pretenders invited the band to support them on their European tour. 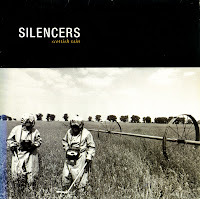 In 1988 The Silencers toured Europe with The Alarm and 'Painted Moon' became a radio hit in Britain. The band moved back to Scotland and recorded second album 'A Blues for Buddha', with Flood producing. The first single drawn from that album was 'Scottish rain', a song about love and fallout from Chernobyl. The band then toured Europe with Simple Minds for four months, culminating with a stadium show at Wembley in front of 80,000. It was my sister who'd discovered the Silencers and bought this single. I bought it soon after and was pleasantly surprised that it came in a gatefold sleeve - always a nice item. My sister actually saw them play live in Rotterdam, supporting the Simple Minds - my interest waned after this one single.